Buy Karl Foerster Grass here at Greenwood Nursery. Karl Foerster Grass, Calamagrostis x acutiflora, is a cool season ornamental grass that makes a great contrasting element with low growing flowering shrubs and perennial plants. The Karl Foerster ornamental grass can be uses as a specimen, for borders or as hedges or screens and makes a good backdrop for colorful shrubs such as roses. 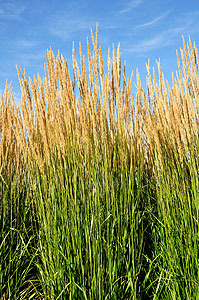 In 2001, this feather reed grass became the first ornamental grass to be named 'Perennial Plant of the Year'. You will find the Karl Foerster Grass a very strong native grass as it maintains its upright position without being to rigid in appearance. Flowers appear in June, which is earlier than many other ornamental grasses. At first they are loose, feathery and pinkish in color, then, through the summer, they become very narrow, gradually turning a wheat color lasting through the fall. The flower stems of the Karl Foerster Grass grow bolt upright and stand up beautifully through summer and winter. Cut and dry the grass plumes for flower arrangements, or let them stay in the winter garden for texture and contrast. You will want to trim the grass to the ground in spring as the plumes will persist most of the winter.